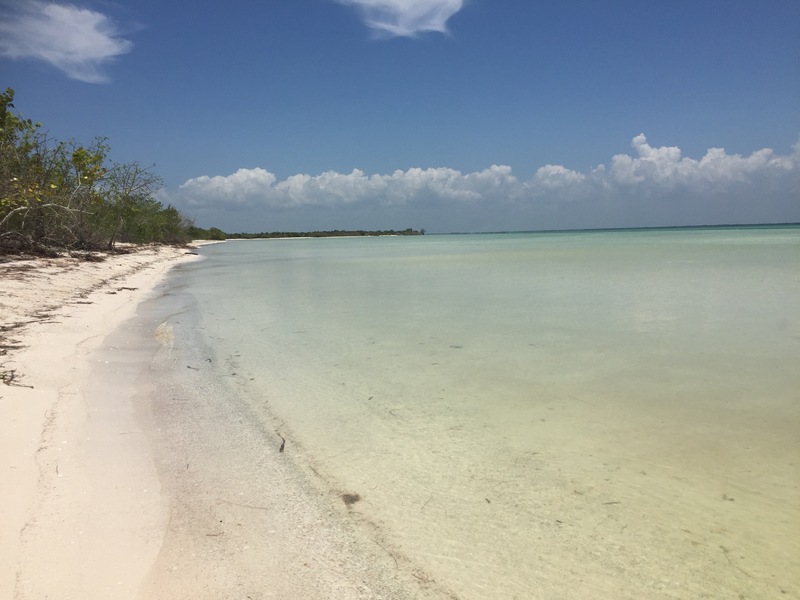 Isla Holbox is a gorgeous island off the coast of the Yucatan Peninsula in Mexico. The island itself is fairly long, about 40 km, but only part of it is inhabited. The island has kept much of it’s original charm, as there are no cars allowed on the island. People get around on foot or by golf cart. 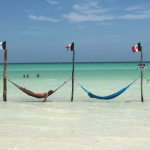 Watch the video below to get a good idea of what Holbox is all about! Another attraction is the resident colony of Flamingos. It’s quite an amazing sight to see these elegant creatures line up and march through the shallow waters surrounding the island. Holbox has one of the safest beaches for learning how to kiteboard. Conditions are ideal for beginners, as the beach has shallow waters, no big obstacles on the wide and long beach, many days of wind during the winter months, and a nearby school with professional instructors. Advanced riders can find also very good conditions when the north or south winds reach 25 knots or more. 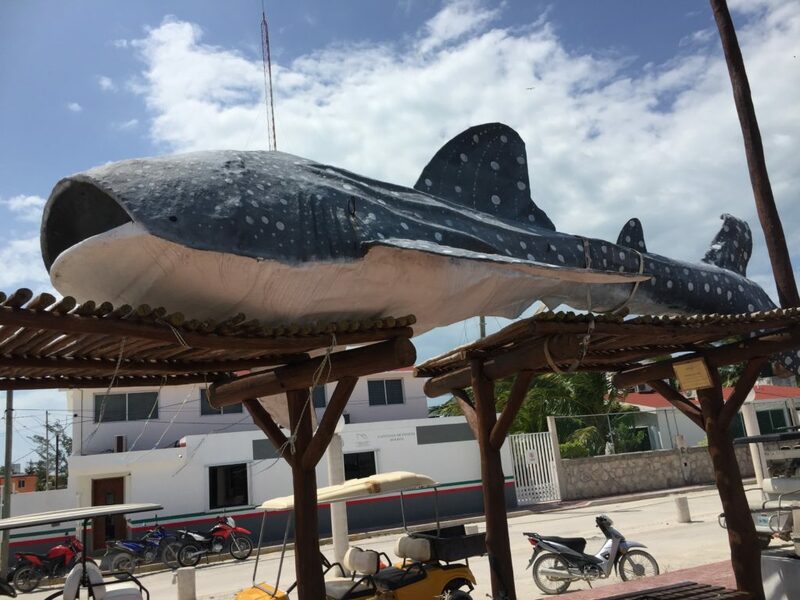 The whale shark tour is the most popular tour in Holbox in the summer season. I’ve been wanting to see these amazing creatures in the wild for a long time. However, locals informed us that it’s a long ride on the boat and chances are that the sharks won’t show up, so I opted out of the adventure. This was one of my favorite activities on the island. It’s super fun to ride the cart and discover the island. The cart can go pretty much everywhere and it’s not a problem to drive through the sand. The only challenge is to cross the small stream on the east-side of the village. Depending on how much it has been raining, it may or not be too deep to cross. When I was there, it was possible to cross but it took three people pushing it through the water. I was lucky that another cart was at the site when I crossed so we could help each other. A must do when you visit the island and in my opinion the Nr. 1 activity, unless you want to go for the whale sharks I guess. The best way to see them is to go early in the morning, drive eastbound from the village to a place called Mosquito point. There you have to swim across a small river to get to the other side of the island. Don’t worry, there are probably no Crocodiles. At least, I didn’t see any. 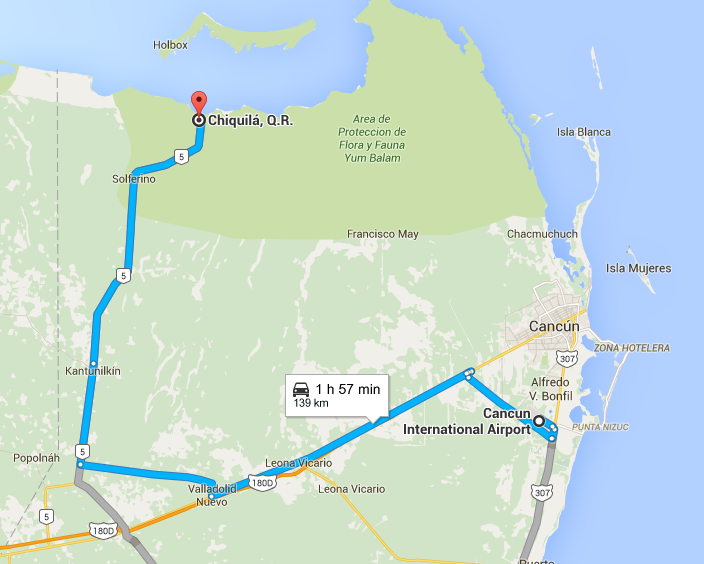 To get to Hotbox by car from Cancun you need to drive to the village of Chiquilá and take a ferry to Holbox. You can take your car to the island, but I recommend you park it for about $4 per day near the harbour, as the island doesn’t have any concrete roads and you really don’t need the car. From Cancun airport (where most rental car agencies are located) it’s a two hour drive, the roads are pretty good except for the last part where you may find some holes in the road. If you rent a car: renting a car is very cheap, often just a few dollars a day. The catch is that you’ll have a leave a $2500 deposit if you don’t insure the car and the insurance isn’t cheap, about $30 – $40 a day. So that’s where the rental company makes the money. If you don’t insure it, make sure to take pictures of the car before you leave. On returning the car, it’s very easy for the rental company to keep some of the deposit to cover damages that may or may not have been there. 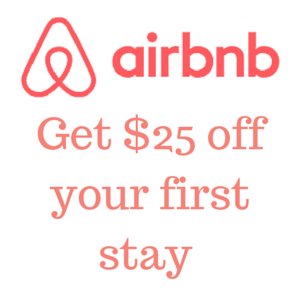 Holboxisland.com offers transfers from Cancun airport and Riviera Maya to holbox in comfortable vans for 8 people, service includes the ferry to Holbox and the taxi to your hotel. I stayed at the Xaloc Resort which I was very happy with (Book here). The resort is located just a five minute walk from the village, which means it’s in that sweet spot of having both the privacy and tranquillity of being outside the main area but still within walking distance of restaurants, supermarkets and everything else that the village provides.